I carry hand sanitizer with me everywhere I go. I know that might sound paranoid, but I don’t want to pick up germs just because I had nowhere to wash my hands before eating. I also think it’s just a good precaution since I have kids and I want them to stay safe from germs too. But I don’t like the hand sanitizers you can buy at the store. They don’t smell all that great and half their ingredients look like weird additives … yuck, who wants that? So I wanted to learn how to make my own. I thought it would be super complicated, but actually it was really easy thanks to this video from Mom Hacks. You only need a few ingredients: aloe vera gel, essential oils, and witch hazel. The steps to combine them to use are fast and easy. 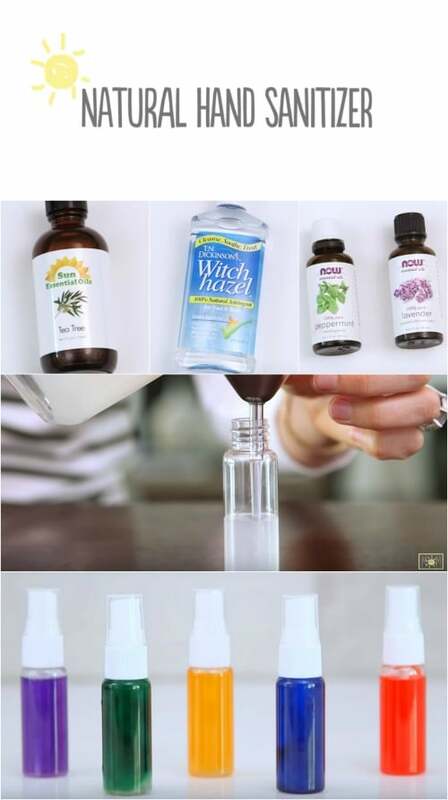 Brooke uses tea tree oil, vitamin E oil, and lavender and peppermint oil in her recipe, but you could choose whatever oils you want to customize this recipe, which I think is awesome! Enjoy! Tutorial and video by WhatsUpMoms. I’m just getting into essential oils! Will have to look around your site to see what I can do with them! Thanks!